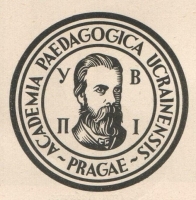 Mykhail Drahomanov Ukrainian Pedagogical Institute (1923–1933) was founded by the Ukrainian Public Committee, the central organization of Ukrainian emigration in Czechoslovakia, in Prague in July 1923. Originally it was created to educate teachers of children of Ukrainian émigrés. After the Public Committee split in 1925, the school became independent and changed into a higher pedagogical institute. Leonid Biletskyi was the first director between 1923-1926. He was succeeded by Vasyľ Simovych (1926-1930) and Vsevolod Harmashiv (1930-1933). In 1930, the Czechoslovak Ministry of Education decided to close it and three years after, the institute stopped working. During the 10 years of its existence, 178 graduated from the institute (85 students with degrees in pedagogy, 31 with doctoral degrees). The poet Olena Teliha was, for example, one of the students. Amongst the faculty, there were 92 professors, including such famous names as Sofia Rusova and Ivan Horbachevs’kyi. In 1925, the Ukrainian Gymnazium (Grammar School) was created and affiliated to the institute. It worked until the end of the WWII, when it moved to Germany. The collection contains of archival documents from 1924-1932. Perhaps the most important section are the "Protocols if the Institute Senate from 1928-1930” (catalog number 412-416) describing daily matters and detailed school activities as well. Other important files are the “General Documents” (catalog number 1-6) and the “Personal Documents – Lecturers and Employees” (catalog number 7-99). In the first file, we can find lists of lecturers and students from various periods. In the latter, there are not only CVs and personal documents of professors, but also personal information such as about their health condition etc. The file "Personal Documents – Students” contain less important information mainly about study results of students. Another file, “Scholarships” (catalog number 139-144), provides additional information about students, whereas in the file “Accounting” (catalog number 119-125) can be found information about financial situation of the institute. Correspondence, although it is relatively large, does not generally contain any new information, except for the correspondence with the Ministry of Education (catalog numbers 158 and 282) and with the Ministry of Foreign Affairs (catalog numbers 159 and 284). The last file contains materials from the Ukrainian Orphanage. It was not a part of the institute; however, the main role in the process of its creation was played by the institute professor Sofia Rusova. Those who are interested should visit the Czech National Archive for additional materials (boxes -RPA 123, MZV-RPA 124 and UM 17) and the Archive of Ministry of Foreign Affairs (section II 1918-1939, box 260). However, most information can be found in the CDAVO Ukraine (Central State Archive of the Highest Organs of Government and Administration) in Kiev (file 1972).